There are two things which America appears to agree on: Thanksgiving and bacon. And while Black Friday is slowly squashing the gathering of friends and family to give thanks and share food, the allure and holiness of bacon doesn’t appearing to be waning. 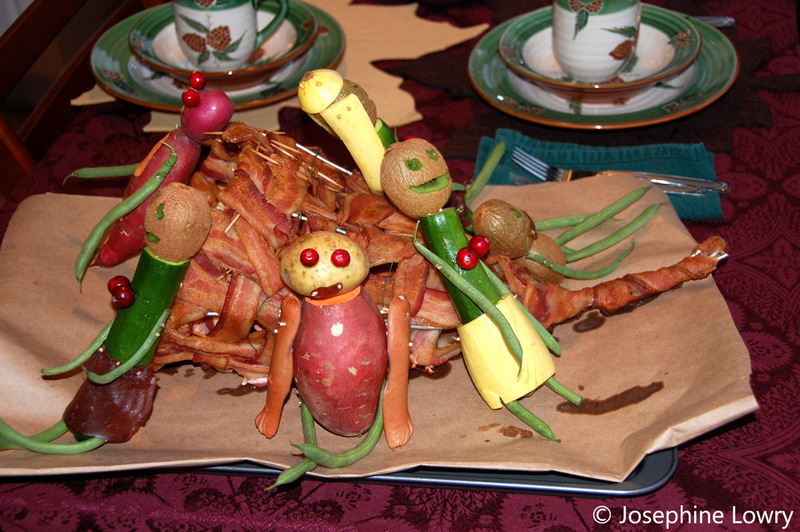 I like bacon as much as any meat-loving lady, but after this year’s centerpiece, it’ll be a while before I spend much time with it again. In previous years I’ve made a “Sarah Palin Turkey Massacre” centerpiece and “Zombie Hot Dog Pilgrims Aboard Squash Boats in Route to a Cher-topped Plymouth Rock”. But this has been a big year change of for me and I wanted to celebrate the holiday with a smidge more … tradition. Like any good project, my bacon cornucopia needed a bit of structure. And as I’d neglected to buy chicken wire the day before the holiday, I had to improvise with sculpting wire and floral wire. During the weaving process, I learned that bacon is a slippery medium and the process would have been much easier with a chicken wire form. Once the bacon was mostly successfully wrapped around the form, I placed it in a cold oven and set the temperature to 350. As per the advice of a wise co-worker, I wanted the oven to slowly warm and cook the bacon to reduce the amount of grease splatter. 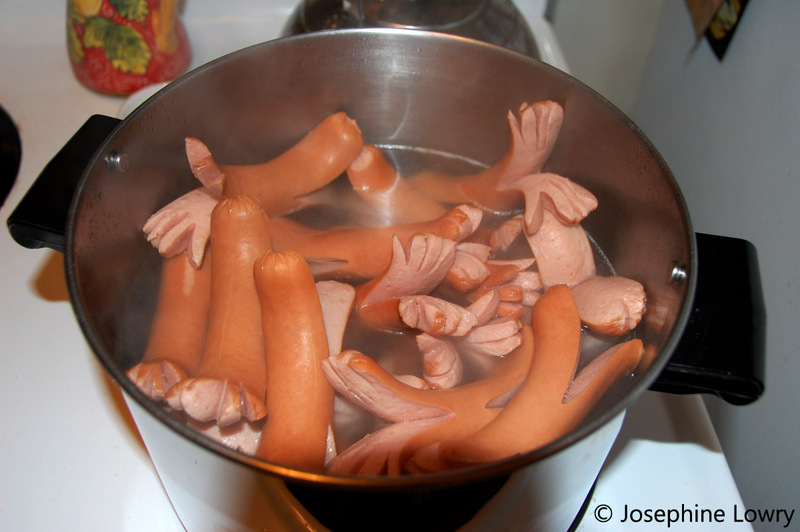 As the bacon was cooking, I cut legs, arms, and hands into the hot dogs and boiled them. I’ve learned that cutting the hot dogs prior to boiling them encourages the shapes and splays the legs/arms in a most pleasing manner. As typical with my food art, I rely more on spontaneous creativity as it (usually) lends itself to better end results — and truthfully, it’s a lot more fun. So rather than using the lil smokies that I that I bought, I ended up using yams and other veggies that I had. 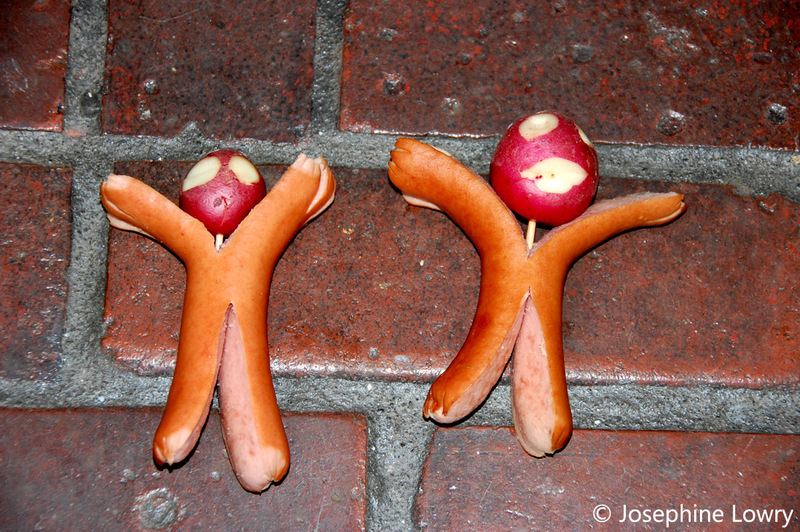 For the hot dog men, I attached potatoes for their heads and carefully cut out eyes and a mouth. 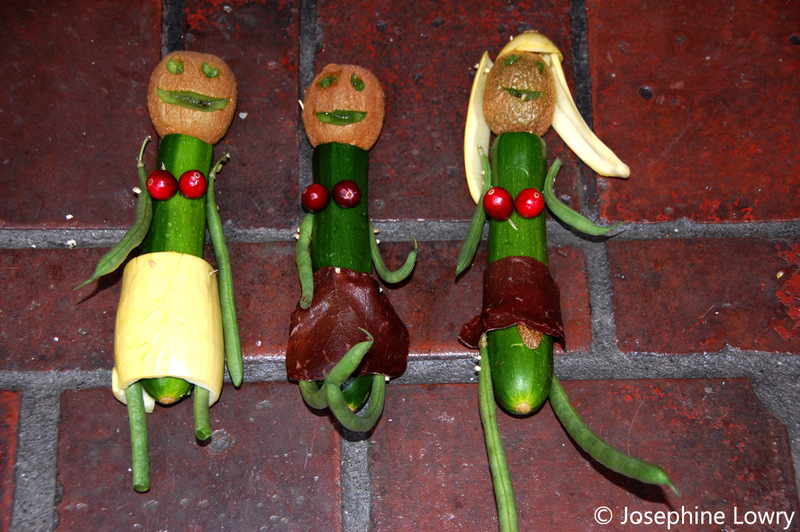 For the women, I used zucchini for the bodies and kiwi for the heads. I’ve also figured out that cranberries make the best boobies. They’re appropriately sized and who doesn’t like a burst of bright color. I hollowed out one of the yellow squashes to make a skirt, but opted to use dried beef for the other two skirts as the beef was more pliable and easier to work with. It was around this time that I realized this project was taking longer than expected and I needed to step it up a bit or I’d be late to dinner. I think it was also around this time that I got a text from the boys saying that they were looking for me. Uh oh. I wanted to make more men out of the hot dogs, but I opted for impact rather than quantity. 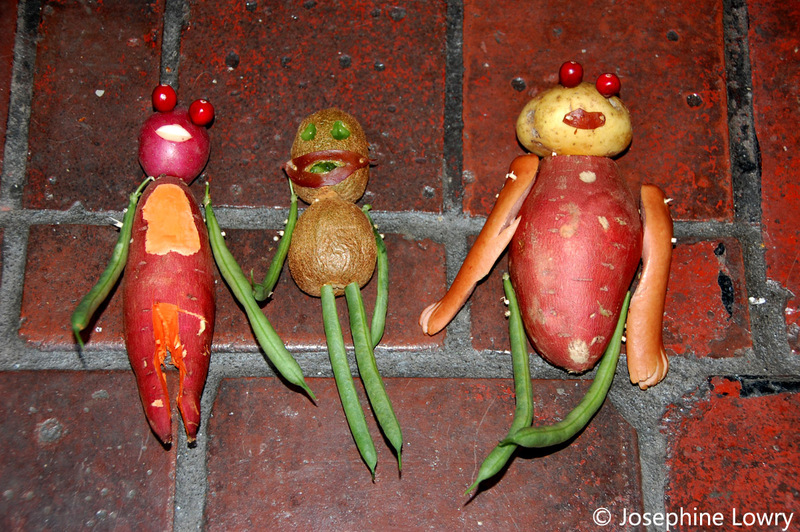 Using garnet yams, I created two different bodies and used red and white new potatoes for the heads and green beans for the arms and legs. And for the other man, I used kiwi to represent a hairy man with a hairy chest. Food art should be authentic, right? 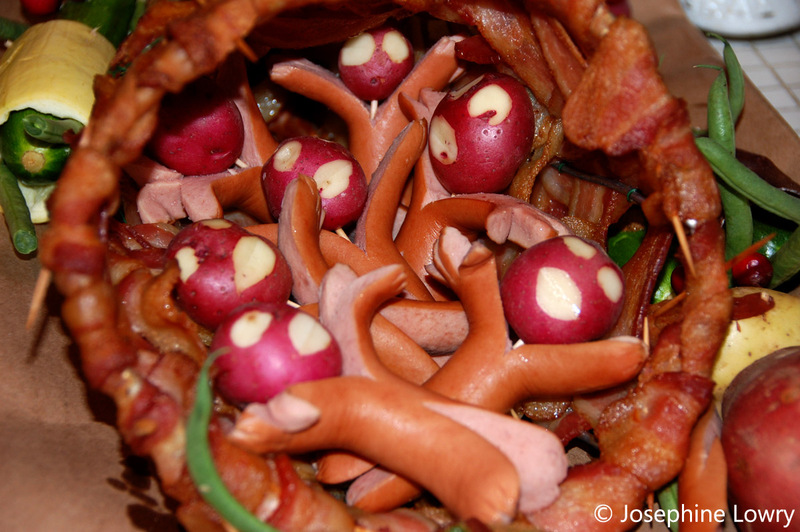 With the clock ticking, I grabbed the men and ladies and bacon cornucopia and headed to dinner. Once I arrived, I arranged the centerpiece on the well-dressed table and dinner was served. Being unable to cook turkey (thank you 7th graded biology and the dissection class), I don’t always have a lot to offer Thanksgiving food-wise. So, it’s a pleasure to be able to help set the table and make people laugh. u too funny! that bottom homunculi lookin’ picture made me think that! Ryan! So great to hear from you. Let me know what you think of those restaurants we recommended. Oh. You mean the Hot Dog Hot Tub. And yes, that one is a bit weird. More focus on the hot tub vs. cooking pot.